Can't say I love the unis. Actually not at all. Maize numbers are an interesting choice. Looks to me like the maize's don't all match up. 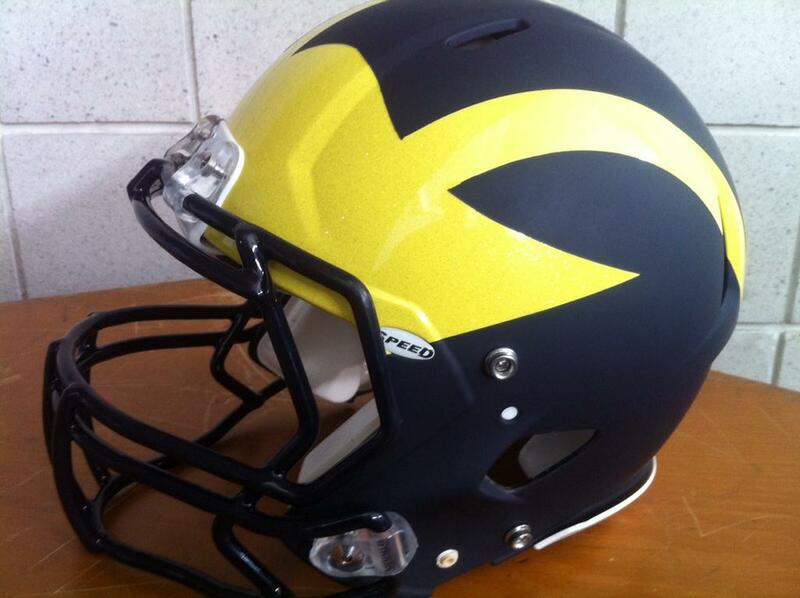 I've been waiting for the day when Michigan would attempt a matte helmet. It's not bad. At least the maize isn't chromey like MSU's green or OSU's red when they played us. ANN ARBOR, Mich. -- The coaches and seniors of Team 133 and Michigan football's official apparel provider, adidas, have teamed to create a special white jersey for the 2013 Outback Bowl game against South Carolina on Jan. 1, 2013. "We enjoy wearing unique uniforms for special games, and that's what it is for us seniors and this team," said senior safety and captain Jordan Kovacs. "It will be fun going out and playing for Michigan one last time in these uniforms." 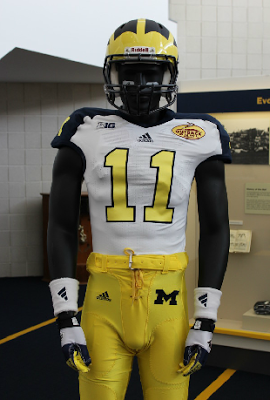 The Wolverines will feature a white jersey with blue across the shoulders and down to the sleeve. 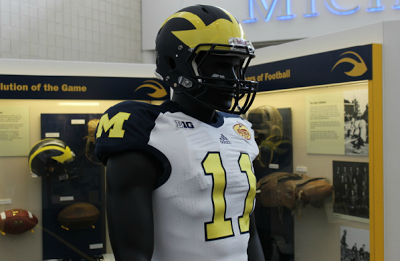 A maize block 'M' will appear on the left and right sleeves of the jersey, and the player numbers will be maize with a blue outline, while the player's last name will appear in blue. The phrase, "It's Great To Be A Michigan Wolverine," will be stitched into the inside neck of the jersey and will be displayed on blue and white undershirts. Michigan will wear its traditional maize pants with the blue block 'M' on the left hip, with blue socks, and also will wear adizero 'M' Statement gloves. In addition, U-M will don a helmet with a navy matte finish and traditional maize wings. The helmets and a limited number of jerseys will be auctioned off following the game at MGoBlue.com. The proceeds from the online auction will benefit the U-M Community and University Engagement Office that supports the community service initiatives supported by Michigan student-athletes. This will be a one-of-a-kind auction of game worn bowl apparel. "I love them," said senior quarterback and captain Denard Robinson. "We only saw a photo of them early in the year, but I think they look even better. It will be fun, but we know we're going to Tampa to play a football game and a great team in South Carolina, so we have to stay focused." 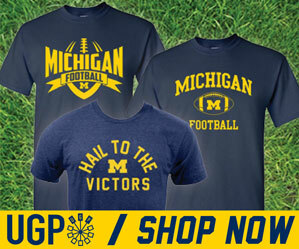 Michigan is making its 42nd all-time bowl appearance and its fifth appearance in the Outback Bowl. The No. 19 Wolverines (8-4, 6-2 Big Ten) will face No. 11 South Carolina (10-2, 6-2 SEC) at 1 p.m. on New Year's Day in Tampa, Fla. The game will be televised on ESPN.